Below are free printable copies of Balance Quest (BQ), a math puzzle game invented by Whit McMahan. If you enjoy sudoku, kakuro, mathduko, and other math logic puzzles, give this fun and challenging brain game a try. BQ is a numeric progression puzzle. Your job is to fill the gaps in the hierarchy of numbers to exactly "zero out" the left and right sides of the puzzle. Whit describes Balance Quest as a "jigsaw puzzle for numbers." 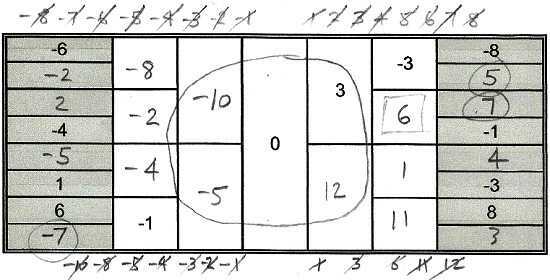 It reminds me of a cross between sudoku and a magic square. 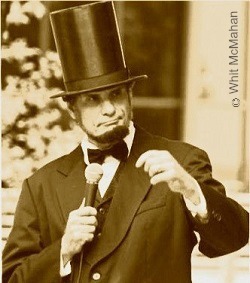 (Whit, by the way, is an ardent practioner of Abraham Lincoln's favorite memorization technique). Don't worry, it's easy to catch on to the rules of BQ. I explain them below, including a detailed example. When you've exhausted the free sample puzzles on this page, go ahead and buy Whit's book (shown at right). His book contains dozens more for you to solve. Not only that, by purchasing the Balance Quest book you'll be supporting the most talented Abraham Lincoln look-alike network administrator on the planet (true story, see below). Before I explain how the Balance Quest math puzzle is solved, here are a few so you can see what they look like. There are more at the bottom of this page and in Whit's book. Note: These puzzles are provided here with Whit McMahan's permission. The goal of Balance Quest is to balance the left and right sides of the puzzle. There are two puzzle sizes, small and large. The small puzzle has 8 gray cells in the outer left and right columns. Thus, it's referred to as a "size 16" puzzle. The large puzzle has 16 gray cells in the outer left and right columns, so it's a "size 32" puzzle. Puzzles also vary by level of difficulty: Easy, Intermediate, or Challenging. Difficulty is determined by how many (or how few) cells are prefilled. When starting out, try an Easy size 16 puzzle (the smallest size, easiest level) first. The first Balance Quest puzzle I attempted was a size 32 Intermediate that promptly stumped and intimidated me. Switching to an Easy size 16 helped me understand the rules and strategies. If you've made it this far, you're hopefully decided to give Balance Quest a try. Good! Let me walk you through it. I'll use a small "size 16" puzzle to illustrate. The rules are the same regardless of puzzle size. Materials Required: a printout of the puzzle, plus a Pencil with eraser! As you can see, the puzzle is rectangular, with the long side horizontal. It's divided into 7 columns. The 2 outermost columns are shaded in gray and include 8 cells each. Some cells are prefilled with numbers. If you've ever played sudoku or kakuro, you'll recognize the prefilled numbers are provided to give you a starting point. The highest math you'll need is the ability to add and subtract integers. "Integers" are positive and negative whole numbers, including zero. For example, 5, -7, 0, -2, and 4 are integers. The value in each white box must equal the sum of its adjoining half-height boxes. 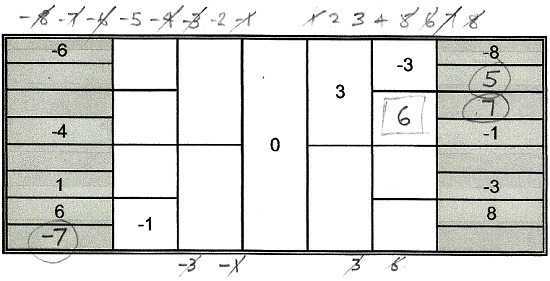 The shaded boxes include all numbers from -8 through 8 (for a size 16 puzzle), except 0. No duplicate numbers may exist among the white boxes, or among the shaded boxes, but duplicate numbers may exist between the white and shaded boxes. I'll walk you through the main steps of solving the size 8 puzzle above to show you how this works. STEP 1. As your first step, go for the low-hanging fruit (the more obvious cells). In the puzzle above, the lower-left corner has 6 in a gray cell with -1 in the white cell to its right. Keeping in mind that the sum of 6 plus the gray box below it must equal -1, we calculate that the empty cell must contain a -7. That is, 6 + (-7) = -1. Following the same logic, the second gray cell in the right-side gray column must be 5. Since -8 is provided in the gray cell above it, and -3 in the white cell to the left, the only number to give this result is 5. In other words, -8 + 5 = -3. I've circled the two numbers I entered so far (the -7 and the 5). Notice I've listed the numbers -8 to 8 (excluding 0) at the top of the puzzle. I did that to keep track of which numbers have already been entered in the gray boxes. As the rules state, I need to enter -8 to 8 in the gray boxes without any duplicates. I've crossed out the numbers used in the gray cells so far. STEP 2. After filling in the obvious gray cell entries, look for any easy pickings in the white cells. Right away, I see the cell below the -3 white cell can be solved immediately. Notice there is also a 6 in the left-side gray column. It's okay to have a duplicate between gray and white cells. Just no duplicates within a white or gray group. With that new entry (the 6 in the white cell), I can work back to one of the gray cells. Given the 6 in the white cell plus the -1 in the cell to the right of it, I can determine the entry for the cell above the -1 must be a 7. That is, -1 + 7 = 6. It's time to start trying out different permutations with the unused gray cell numbers. At this point, the unused gray cell numbers (as shown along the top of the puzzle) are -5, -2, 2, 3, and 4. One by one, plug in these numbers and calculate the results. There may be many false starts, where your "final 4" white cells don't balance out to zero. Keep trying different combinations, as persistence is the name of the game. This is a quest, after all. Also, notice I've started listing the used white cell numbers at the bottom. This helps me avoid inputting duplicate numbers in the white cells. Depending on the difficulty of the puzzle, finding the solution may take you a few minutes to several hours. After much experimenting and persistence (and erasing - that's why a pencil with eraser is essential), you'll eventually balance the puzzle. I've circled the inner 4 white cells that surround the center 0 cell. Notice these cells zero out on their respective sides. The left-side numbers are -10 and -5, which sums to -15. The right-side numbers are 3 and 12, which sums to 15. So we get -15 + 15 = 0. The puzzle balances! Congratulations, now you know how to play Balance Quest. Here are more Easy size 16 and 32 Balance Quest puzzles you can print out for free, compliments of Whit McMahan. 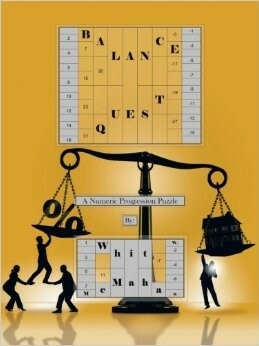 For more Easy puzzles, plus Intermediate and Challenging puzzles, go ahead and buy Whit's book . For a different but related type of puzzle, check out Whit's Checkerboards Balance Quest puzzles (including free samples). Whit McMahan, the creator of Balance Quest, is an interesting character. Literally. One of his passions is acting as an Abraham Lincoln look-alike. During the day, Whit is a computer science and network specialist in Nashville, Tennessee. He also enjoys writing short stories and poems. Whit developed the concept for Balance Quest by experimenting with recursive addition and convergence properties of certain sets of integers to zero. He then wrote a computer program that generates the Balance Quest puzzles. He published his Balance Quest puzzle book in 2012. You can find it on Amazon.com . To contact Whit or see what's new with the game, visit his Facebook page and BQ Blog. Whit tells me that a Grand Master level is being published soon.